Let’s talk about books. (“Oh noooo!” the voices of thousands cry in unison, “Not booooks, on my mooooovie site!”). That’s better. Now, I’m a major nerd, and most of the time when I know that a movie is based on a book I’m pretty stringent about reading that book. Other times, I have no idea until much later that a book ever existed. At that point, I try to track it down. I was all set to make a fanatical case for the book being an inviolate art form incapable of proper transmission to the screen. I sat down in front of my computer and cracked my knuckles (which, by the way, kind of hurts). “Brain,” I thought, “this opinion piece ain’t gonna write itself. Get to work!” And work it did. You can imagine the vision-blackening rage that engulfed me when I realized my chart was actually pretty evenly spaced. If anything, I had a surplus of entries waiting to get on the “I love you both, for different reasons” category. I love you both for different reasons?? What the hell kind of Dr. Spock child-rearing happy household crap is that? I wandered around for hours (in the pouring rain, of course), ripping out my hair and weeping and racking my brain for a solid opinion, desperate to find a way around this startling evidence of my indecision. Last week I said I would talk about book adaptations! What am I going to say? I have a readership of MILLIONS desperate to get my opinion on this! Well, I came to a conclusion. A simple, self-serving conclusion. Sometimes I really love a movie. It blows my mind. I want to watch it again immediately to catch all the bits I missed. When this happens, then it is a work of entertainment in its own right, and who cares if it diverted from the book? 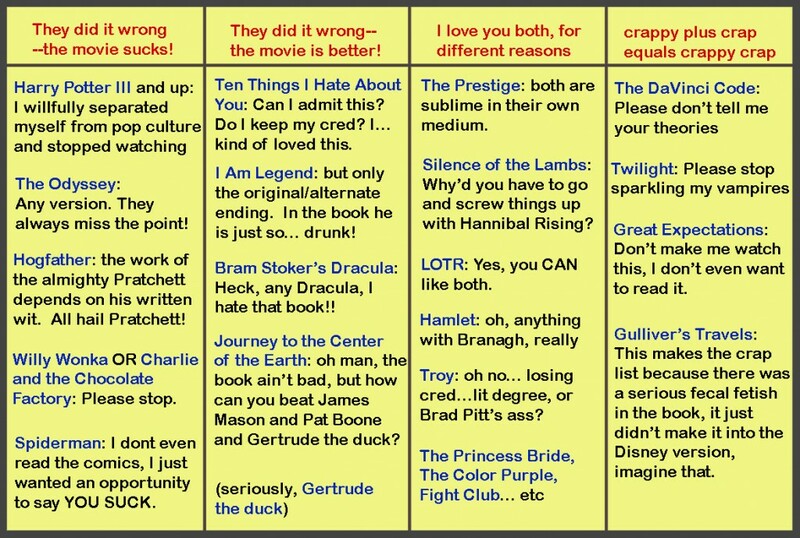 You can’t translate a book exactly to the screen, so everybody stop getting all worked up. “Lord of the Rings?” Cinematic awesome. “The Running Man?” Oh, PLEASE DO replace ominous men in suits with a fat guy called Dynamo who sings opera in a Lite-Brite vest. And on the flip side, when I dearly love a book, to the point where I will interrupt my friends and family to read them my favorite clips, at rapid speed, with no concern for individual character voices—oh dear, when that happens, don’t you dare make some piece of crap film, just leave it alone why don’t you, it wouldn’t work as a movie don’t you get it? Stanley Kubrick, everybody loves you, but some people love the novel “The Shining” even more, so why don’t you write your own crazy-guy-in-a-hotel plot and leave King alone? “Charlie and the Chocolate Factory” is not supposed to have psychedelic acid trips, or some stupid goggle-eyed Johnny Depp, and Charlie never breaks the rules, that is the whole point, aargghh! Because when it comes to your all-time favorites, you can’t help but defend them, no matter which side of the debate they fall on. I suppose what I really decided was… sometimes it’s okay to be a hypocrite. But sometimes it really isn’t—because I’m a hypocrite. So what are your hot button movies? Are you pro-squid? Was your favorite character Tom Bombadil? Did you disagree with every single item on my chart, what the hell am I doing talking about movies in the first place, I left out the most important examples of all time, omg? Do discuss. The History of Film: Magic Lanterns!